16,550 pages of the Congressional Globe, which later became the Congressional Record, covering debates and proceedings of the 37th, 38th, and 39th congressional sessions of the Senate and the House of Representatives, messages of the President to Congress and reports of cabinet officers, dating from March 4, 1861 to July 28, 1866. Each volume contains an index to the Senate and House Debates. In addition to the record of debates of Congress, each volume has Appendixes and an index to the Appendixes, containing Speeches of members of Congress not transcribed in the main body of the journal, messages of the President, the text of the laws, and reports of heads of departments. The disc contains a text transcript of all computer recognizable text embedded into the graphic image of each page of each document, creating a searchable finding aid. Text searches can be done across all files on the disc. The United States Constitution mandates that "Each House shall keep a Journal of its proceedings," (Article I, Section Five). In 1848, the Congressional Globe, the Congressional Record's immediate predecessor, became the first publication to attempt measure-by-measure coverage of Congress. The Congressional Globe was preceded by the Annals of Congress. Previous legislative chronicles and private political newspapers did not record all or even most of the debates. In fact, the newspaper editors asserted their right to omit material they found "eternally repetitious" or of little interest to their readers, and the articles they did print were sometimes colored by their highly partisan views. Supported by President Andrew Jackson, the printing partnership of Francis Preston Blair and John Cook Rives founded the Congressional Globe in 1833. Whigs distrusted the Globe's version of House and Senate proceedings, and called Blair and Rives "habitual falsifiers of debate." The partners were met with such hostility that they allegedly carried concealed weapons in order to protect themselves against angry members of Congress. In 1846, the Senate authorized its members to subscribe to their choice of a political newspaper of record, and the Globe, by its popularity, became the institution's semiofficial publication. Two years later, the Senate contracted with newspapers to provide coverage to the Globe, an arrangement emulated by the House in 1850. As a nonpartisan publication, the Globe utilized a corps of reporters trained in the latest stenographic techniques, and began printing debates as first-person narratives rather than third-person summations. The role of Congress as a body and of its two houses changed considerably over this period. Legislative activism reached a new peak during the Civil War years. With Republicans firmly in control, laws on homesteading, railroads, banking, and land-grant colleges laid the foundation for the dynamic era that followed the Civil War. Reconstruction brought achievements and tensions in Congress: the first African-American congressmen and the first impeachment of a president. The enormous number of Civil War era debates forced Congress to consider a more efficient system of reporting. Consequently, members chose not to renew the Congressional Globe's contract when it expired on March 3, 1873. Instead, they established a new publication, one printed by the Government Printing Office and staffed by Official Reporters of Debates, employed directly by Congress. Although the Congressional Record retained the Globe's layout, reporters, and audience, its goal to provide a nonpartisan, substantially verbatim account of all Congressional debates marked a significant departure from the concerns of private editors. The Thirty-Seventh United States Congress was seated from March 4, 1861 to March 4, 1863. Both the United States Senate and the United States House of Representatives had a Republican majority. The 37th Congress began during America's secession crisis. Since the November 1860 elections, 11 Southern states seceded from the Union to form the Confederate States of America. The lack of Democratic opposition in Congress resulted in a rapid increase in the passage of legislation. Many bills passed that were based on initiatives that were decades old and inherited from the Whig Party, that could not previously pass Congress. The 37th Congress, meeting in a Capitol building with an unfinished dome, passed the District of Columbia Emancipation Act, Homestead Act, the Morrill Land-Grant Colleges Act, the Pacific Railway Act, the Revenue Acts, and established the U.S. Agriculture Department. On July 4, 1861, a special Congressional session requested by President Lincoln convened. 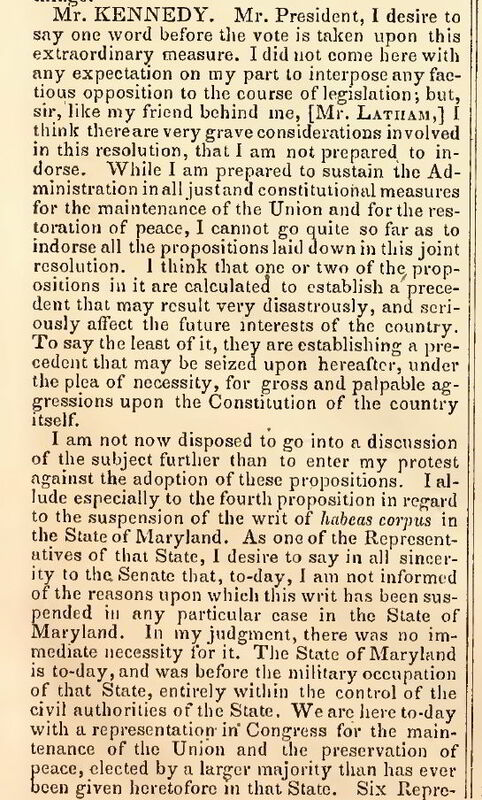 Lincoln sent a message to Congress explaining his actions since the outbreak of the Civil War, including the calling up troops and the establishment of a naval blockade. Congress appropriated $500 million to raise 500,000 troops. The 37th Congress enacted the nation's first Federal income tax. It ended slavery in the District of Columbia and created the Freedmen's Bureau. It sought influence over the conduct of the war by establishing the Joint Committee on the Conduct of the War, which critiqued Northern war strategy and investigated inefficiency and corruption. Westward expansion and settlement were impeded by the debate over slavery. The Republican dominated 37th Congress was now free to promote expanding America westward. The passage of the Homestead Act allowed federal land in western territories to be granted to any citizen who agreed to improve and live on the land. With the Pacific Railway Act, Congress provided federal funds for building the first transcontinental railroad. The Arizona Territory, Idaho Territory and Nevada Territories were either established or expanded. Legislation created West Virginia by splitting territory off of Virginia. March 11, 1861 - The Confederate States adopt their own constitution. April 12, 1861 � The American Civil War begins with the Battle of Fort Sumter. April 27, 1861 - Writ of Habeas Corpus Suspended. President Lincoln sought support from state militias after the attack on Fort Sumter. While passing through Maryland on the way to Washington, some Northern troops were attacked by Confederate sympathizers. In response to this, President Lincoln declared martial law in the region. General Winfield Scott was authorized to ignore the writ of habeas corpus when he found it necessary to control insurrection. This controversial decision was defended by Lincoln during the special session on July 4, 1861. The President sought the authorization of Congress for this action. In time Congress passed a bill, which was signed into law on March 3, 1863, giving Lincoln the authority to suspend the writ of habeas corpus if it was as necessary to do so to counter the rebellion. July 21, 1861 � With members of Congress as onlookers, the first major battle of the Civil War, the First Battle of Bull Run at Manassas Junction, Virginia, was fought. The battle ended in a Confederate victory. Spectators, many bringing along picnic baskets and opera glasses, along with many curious members of Congress traveled 30 miles from Washington to Centreville, Virginia, to watch the battle of Bull Run at Manassas. The Confederate forces defeated an overconfident Union army. While Senator Henry Wilson distributed sandwiches, a Confederate shell destroyed his buggy, forcing him to escape on a stray mule. When Union generals ordered a retreat mayhem ensued. Michigan Senator Zachariah Chandler tried to block the road to stop the retreat. Senator Ben Wade of Ohio, incensed at the possibility of defeat, picked up a Union soldier's discarded rifle and threatened to shoot any soldier who ran. Iowa Senator James Grimes barely avoided capture. New York Representative Alfred Ely was captured by the Confederates and brought to Richmond as a prisoner of war. In response to the embarrassing defeat at Bull Run, and later, at Ball's Bluff, Congress created the Joint Committee on the Conduct of the War to investigate many aspects of the war. August 5, 1861 - First federal income tax. In order to help pay for the war, Congress passed the first income tax as part of the Revenue Act of 1861, collecting 3% tax on all incomes over $800. August 6, 1861 - Confiscation Act of 1861. The First Confiscation Act (Sess. 1, ch. 60, 12 Stat. 319) was passed after Union Generals pointed out the use by Confederate forces of slave labor to aid the Confederate war effort. The First Confiscation Act allowed seizure by the Union Army of any property used to aid the Confederates, including slaves. October 21, 1861 - Oregon Senator Edward Baker killed in battle. Baker was a Mexican War veteran and an advisor to President Lincoln. While leading 1,200 Union troops across the Potomac River in an attempt to take Leesburg, Virginia, his brigade was stopped by rebel forces at Ball's Bluff, where they suffered heavy casualties. His death made him the first and only sitting senator to die in a military engagement. November 6, 1861 - Jefferson Davis is elected president of the Confederate States of America. David Von Drehle, Time Magazine Editor-at-Large and author of "Rise to Greatness: Abraham Lincoln and America's Most Perilous Year," has called 1862 the pivotal year of American history, "The year in which the Civil War became a cataclysm, the federal government became a Colossus, and the Confederacy came the nearest to winning its independence, yet suffered the key losses which led to its doom. ...the year Abraham Lincoln established his greatness; it was the death knell of American slavery." January 30, 1862 - The first US ironclad warship, the USS Monitor, is launched. February 13, 1862 - Capital's Fortification System - Congress approved the funds for the construction of a system of fortifications to protect the District of Columbia from Confederate attack. By 1865, the Union capitol was the most fortified city in America. It had 68 forts, 20 miles of rifle pits, 807 guns and 98 mortars strategically placed along a 37-mile circle of fortifications. February 15, 1862 - Legal Tender Act. Until this bill passed Congress and was signed into law, gold and silver coins were the only federally accepted legal tender. As war spending increased, gold and silver coins were becoming scarce. Congress responded by passing the Legal Tender Act, which authorized the United States Treasury to issue $150 million in paper notes, then commonly known popularly as "greenbacks. February 22, 1862 - Jefferson Davis is inaugurated in Richmond, Virginia, the Confederate capitol, to a 6-year term as president of the Confederate States of America. April 7, 1862 - Battle of Shiloh, The Union Army under the command of General Ulysses S. Grant defeats the Confederate army near Shiloh, Tennessee. April 16, 1862 - Slavery abolished in the District of Columbia. The passage of the D.C. Compensated Emancipation Act freed approximately 3,000 enslaved persons. The law mandated payment to slave holders as compensation. May 20, 1862 - Lincoln signs the Homestead Act into law. July 1, 1862 - The Revenue Act of 1862 (Ch. 119, 12 Stat. 432). Eleven months after Congress established the first Federal income tax; it passed legislation to raise taxes. The annual income threshold for paying the 3% tax was lowered from $800 to $600. U.S. residents earning over $10,000 per year paid a higher marginal tax rate of 5 percent. The law established the Bureau of Internal Revenue whose name was later changed to the Internal Revenue Service. June 1, 1862 - Robert E. Lee is given command of the Army of Northern Virginia. July 1, 1862 - Lincoln signs into law the Pacific Railway Acts, authorizing construction of the First Transcontinental Railroad. July 2, 1862 - Lincoln signs the Morrill Land Grant Act into law, creating land-grant colleges to teach agricultural and mechanical sciences across the United States. Today there are approximately 110 Colleges and Universities that were established through land grants provided through the provisions of the Morrill Land-Grant Acts. A few private institutions and the plurality of state universities were established because of these land grants including Auburn University, University of Arizona, the California State and University of California university systems, University of Florida, Cornell, Rutgers, Pennsylvania State University and Virginia Tech. July 17, 1862 - The Militia Act. The Militia Act of 1862 (Sess. 2, ch. 201, 12 Stat. 597) allowed for "persons of African descent" to be employed in military or naval service. August 14, 1862 - President Abraham Lincoln meets with a group of prominent African-Americans, the first time a President in office has done so. Lincoln suggests that Black people should migrate to Africa or Central America, but this advice is rejected. September 5, 1862 � Confederate army's first incursion into the North. Confederate General Robert E. Lee leads 55,000 men of the Army of Northern Virginia across the Potomac River at White's Ford near Leesburg, Virginia, into Maryland. September 17, 1862 - Battle of Antietam. Often called the bloodiest day in American history, Union forces defeated Confederate troops at Sharpsburg, Maryland. September 22, 1862 � President Lincoln makes a preliminary announcement of the Emancipation Proclamation. Lincoln says he would order the emancipation of all slaves in any state still in rebellion on January 1, 1863. December 1, 1862 - In his State of the Union message to Congress, President Lincoln reaffirms the necessity of ending slavery as he had mentioned 10 weeks earlier in reference to the Emancipation Proclamation. December 31, 1862 - West Virginia admitted. The law (Sess. 3, ch. 6, 12 Stat. 633) makes West Virginia a state on June 20, 1863. February 25, 1863 - National Banking Act. The National Banking Act (Sess. 3, ch 58, 12 Stat. 665) created a system of national banks for banks, and created the United States National Banking System. March 3, 1863 - The Enrollment Act. This bill also known as the Civil War Military Draft Act and the Conscription Act, established that that all U.S. men between the ages of 20 and 35 and all unmarried men between 35 and 45 could be drafted for military service. Service could be avoided by hiring a substitute or paying the government $300. The Thirty-Eighth United States Congress met from March 4, 1863 to March 4, 1865. May 1, 1863 - Battle of Chancellorsville. General Robert E. Lee defeats Union forces with 13,000 Confederate casualties and 17,500 Union casualties. July 1, 1863 - Battle of Gettysburg. Union forces under George G. Meade turn back a Confederate invasion by Robert E. Lee at the Battle of Gettysburg, the largest battle of the war with 28,000 Confederate casualties and 23,000 Union. July 11, 1863 - Draft lottery held. The beginning of drafting of men to fill the ranks of the Union Army sparks riots in New York City. November 19, 1863 - Lincoln delivers the Gettysburg Address at the military cemetery dedication ceremony in Gettysburg, Pennsylvania. March 9, 1864 - President Lincoln appoints Ulysses S. Grant commander in chief of all Union armies. July 2, 1864 - The Wade-Davis Bill. The Wade-Davis Bill passed both houses of Congress on July 2, 1864. Even though the war was not over, Senator Benjamin Franklin Wade of Ohio and Representative Henry Winter Davis of Maryland wrote a bill with plans for post-war reconstruction. The bill set requirements for the states in rebellion to re-enter the union. The Wade-Davis Bill required that the Confederate states would have to amend their constitutions giving the vote to African-Americans. Confederate states would also need to have 50 percent of its male population take a loyalty oath. President Lincoln was not looking for measures as stringent as those in Wade-Davis, so he pocket-vetoed the bill. However, the bill set the agenda for the way "Radical Republicans" wanted to handle the South. August 5, 1864 - Battle of Mobile Bay. At Mobile Bay near Mobile, Alabama, Admiral David Farragut leads a Union flotilla through Confederate defenses and seals one of the last major Southern ports. October 31, 1864 - Congress passes legislation to admit Nevada into the Union. November 8, 1864 - Abraham Lincoln is reelected president in an overwhelming victory over Democrat George B. McClellan. November 15, 1864 - Sherman's March to the Sea. Major General William Tecumseh Sherman burns Atlanta and starts his "March to the Sea," causing extensive devastation to crops and mills, while foraging off the land. December 21, 1864 - Sherman's March to the Sea ends. Sherman's March campaign ends with the capture of the port of Savannah, Georgia. March 3, 1865 - Freedman's Bureau. Congress passes legislation to establish The Freedmen's Bureau and Freedman's Bank (Sess. 2, ch. 90, 13 Stat. 507). The agency is created to provide food, clothing, medicine, education, employment opportunities and legal services to former slaves. It also creates the Freedman's Bank to provide banking services to African Americans. However, due to mismanagement that bank fails in 1873. The Thirty-Ninth United States Congress met from March 4, 1865 to March 4, 1867. It covered the first month of Abraham Lincoln's fifth year as president, and the first two years of his successor, President Andrew Johnson. March 4, 1865 - The second inauguration of President Abraham Lincoln. April 9, 1865 - Robert E. Lee surrenders Confederate forces at Appomattox Court House, for all significant purposes ending the American Civil War. April 15, 1865 - The assassination of President Abraham Lincoln, Andrew Johnson becomes President of the United States. June 19, 1865 - Union Major General Gordon Granger lands at Galveston, Texas and informs the people of Texas of the Emancipation Proclamation. An event still celebrated each year as Juneteenth. November 10, 1865 - Major Henry Wirz, the superintendent of a prison camp near Andersonville, Georgia, is hanged, becoming the only American Civil War soldier to be executed for war crimes. December 11, 1865 - Congress creates the House Appropriations Committee and the House Committee on Banking and Commerce, reducing the tasks of the House Committee on Ways and Means. December 18, 1865 � The Thirteenth Amendment to the United States Constitution, abolishing slavery is declared ratified by 3/4 of the states of the United States. December 24, 1865 - The Ku Klux Klan is formed by six Confederate Army veterans in Pulaski, Tennessee. The Klan uses terror to resist Reconstruction imposed by the North and to intimidate "carpetbaggers" and "scalawags", as well as to repress African-Americans citizenry. 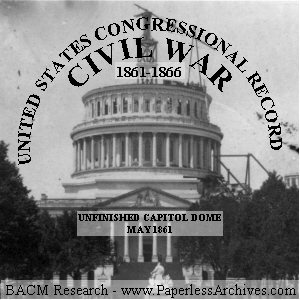 January, 1866 - The second and current United States Capitol dome is completed after 11 years of work. April 9, 1866 - The Civil Rights Act of 1866. After passing Congress, being vetoed by President Johnson, then having Congress override the veto, the bill passes into law. The Civil Rights Act of 1866 attempted to provide further rights to freed slaves. The Civil Rights Bill granted citizenship and civil rights to all male persons in the United States "without distinction of race and color." The bill, introduced by Illinois Senator Lyman Trumbull, tried to offer protection against state laws like the "Black Codes" that limited rights for African Americans in southern states. July 23, 1866 - The Judicial Circuits Act. The Judicial Circuits Act of 1866 (ch. 210, 14 Stat. 209) reduces the number of United States circuit courts to nine and the number of Supreme Court justices to seven. July 24, 1866 - Tennessee becomes first Confederate state to be readmitted to the Union. July 25, 1866 - Congress passes legislation authorizing the rank of General of the Army, now called "5-star general" to Lieutenant General Ulysses S. Grant, the first to have this rank. July 28, 1866 - The Metric Act of 1866 becomes law and legalizes the use of the metric system for weights and measures in the United States. August 14, 1866 - The National Union Convention is held in Philadelphia with hopes to reconcile the Radical Republicans in Congress with the softer Reconstructionist policies of President Andrew Johnson. August 27, 1866 - Swing Around the Circle Tour. From August 27, 1866 to September 15, 1866, Republican President Andrew Johnson goes on his Swing Around the Circle speaking tour to gain support for his Reconstruction policies and campaigns for those candidates in support of his policies, mostly Democrats. This disastrous speaking campaign did not help his preferred candidates in the midterm Congressional elections. The Republican Party wins in a landslide. November 5, 1866 - United States House of Representatives elections, 1866. Elections to the United States House of Representatives were held in 1866 to elect Representatives to the 40th United States Congress (March 4, 1867 � March 4, 1869). The 1866 elections were a decisive event in the early Reconstruction era, in which President Andrew Johnson faced off against the Radical Republicans in a bitter dispute over whether Reconstruction should be lenient or harsh toward the vanquished South. Many of the congressmen from the former Confederate states were either prevented from leaving their home states or were arrested on the way to the capital. The few Southern Congressmen who arrived were not seated. The Republicans election landslide, gave them enough seats to override Johnson's vetoes. Only the border states of Delaware, Maryland, and Kentucky voted for Democrats.